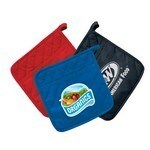 Promotion Pros is the place online to buy custom oven mitts and pot holders to advertise your business. We are stocked with promotional silicone pot holders, silicone oven mitts, uni-holders and more with your logo, so no matter what you're searching for in a promotional oven mitt or pot holder novelty item, you'll find something that fits the bill. Showcase your company name to promote brand recognition and use a functional item like a quilted cotton canvas pot holder, to do it! At Promotion Pros, we offer quality promotional products with your custom logo at affordable prices. 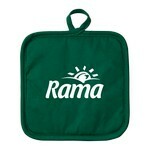 The Silicone Ad Holder features pure cotton canvas fabric construction, Customizable with your company logo. Our Silicone Ad-Mitt features diamond pattern silicone found on the gripping side and makes an excellent choice for Corporate Holiday Gifts. This Da' Cotton Pot Holder is made from two-tone cotton material and has a hanging tab for easy storage purpose. 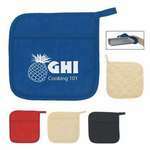 The Da' Oven Mitt with Magnet features a heavy duty magnet sewn in sleeve and a hanging tab facilitate easy storage. Our Deluxe Silicone Oven Mitt features a heat resistant silicone palm that can withstand temperatures up to 464 degrees Fahrenheit. 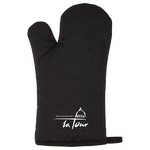 You can handle hot objects in the kitchen with care and ease with this Finger Mitt. It fits your fingers and thumb snugly and protects it from heat. 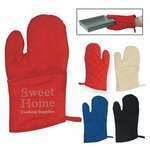 This stylish Frosted Silicone Oven Mitt makes it easy to handle your hot dishes in and out of the oven. It features frosted silicone over your favourite chevron or striped material. 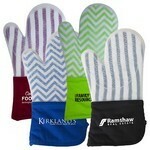 This attractive Oven Mitt with Stripes makes it easy to handle your hot dishes in and out of the oven. 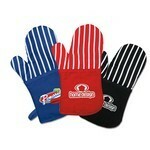 It features soft cotton terry cloth inside, colourful stripes design on the outside and silver heat resistant back. This handy potholder is a must have kitchen accessory. 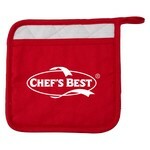 It is a heavy duty pot holder made of heat resistant material on the back. Our Silicone Statements Hot Pad features silicone imprinted images on underside and allows adding brand logo and message to create impressive Custom Giveaways. 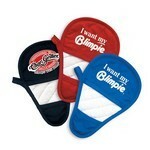 The Quilted Cotton Canvas Oven Mitt is comfortable to wear and easy to use. It is available in black, royal blue, red, and natural colors. The Quilted Cotton Canvas Pot Holder holds your pots and plants safely. It is available in black, royal blue, red, and natural colors.